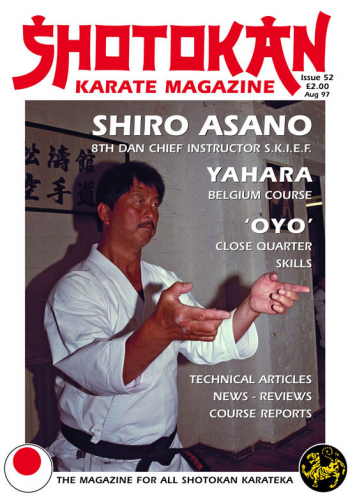 MASTER SHIRO ASANO 8th Dan S.K.I.E.F. MASTER SHIRO ASANO 8th Dan S.K.I.E.F. Interview By Dave Kershaw. SENSEI MIKIO YAHARA (Belgium Course). Report By Bob Sidoli. What is The Special 'Feeling' for Kata? By John Cheetham. YOKO GERI KE-AGE - the New Generation. By Scott Langley. Book Review 'Fit to Fight' & Shotokan Reports. Improve Your Close Quarter Skills (Part Two). By Simon Oliver. SENSEI WILLIAM WONG 7th Dan S.K.I. Interview By Ian Deavin. The Dan Grade 'Examination' Syllabus. By John Cheetham. I was reading again recently, some more criticism of traditional karate and in particular Shotokan. I tried to be as objective and honest as possible in my response. I could see some valid points that I've heard many times before. 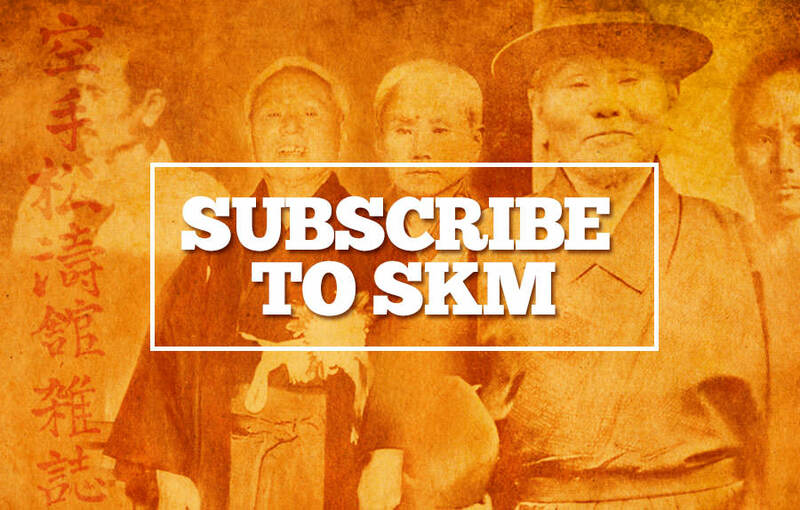 Namely, that most of our (Shotokan's) training is done, especially kumite (sparring) at medium to long range. I think we will all agree on that point. So, I am going to give my own reasons why I think there is nothing wrong with this aspect of our training and in fact why it can be far more beneficial and realistic if thought about constructively. At medium or long range (kumite) it is totally possible to practice 'FLAT OUT' in terms of 'SPEED' and 'POWER'. Top class traditional competition is a perfect example of this. Obviously we must use the utmost 'control' with our training partners to prevent injuries, which no-one wants. Well, no-one I know! Now, at 'close range' and I mean really close, it is simply not possible to exchange 'Head Butts' - 'Elbows' - 'Knees' etc., at the same maximum speed and power. I have never seen this yet in normal dojo training, (only in professional full contact fights). Most close range kumite is done at slow or medium speed. Now, my point is this. We (Shotokan) karateka are training (not always of course) at full speed and power in the various kumite training drills, to develop and maintain body speed, which in reality is a vital factor. So, maybe it's unfair to criticise our methods without fully understanding the reasons. Anyone who has been in a real fight against a ruthless opponent will tell you that 'SPEED' is of the utmost importance. You know the old saying, "You will react how you train." So, if we are practicing kumite fast and furious, then where's the problem? With this in mind I offer my argument to our critics. This is just a personal opinion, I'm not saying ignore close range kumite practice, far from it, it's vitally important but it's so hard to control at 'speed', unlike medium to long range practice. In a nutshell I think that the majority of people would probably benefit more from 'flat out' kumite practice, with a wide range of techniques, to slower or medium speed practice, in the long run! Let's remember also, that Traditional Karateka aren't training primarily for 'street fights', if it happens then so be it, you try to survive at all cost! We had so many letters saying how much everyone enjoyed Enoeda Sensei's interview in the last issue and also the completely different type of interview with Sensei Sumi. Well, I think you will find the same this time with the vastly contrasting interviews with Asano Sensei and the Hong Kong based, Sensei Wong. Enoeda and Asano are from the old school whereas Sumi and Wong have a slightly different approach, although still steeped in the traditional aspects and philosophy. Some of the younger JKA instructors use a slightly different technique with yoko geri keage (side snap kick). Scott Langley explains this method in detail. If you've seen Senseis Kagawa, Aramoto or Yamaguchi (Takashi) demonstrate yoko geri keage, you will know how incredibly powerful and effective their kick appears to be. Try it yourself! WHAT IS THE SECRET OF DEVELOPING THE SPECIAL 'FEELING' FOR KATA? By John Cheetham. By the title of the article, and the word 'FEELING'. I mean that special affinity with the movements/techniques of this particular physical art. I don't mean the 'spirit' of combat or 'fighting spirit' because many people of various nations have natural fighting spirit. I'm just posing the question with regard to purely and simply having a natural physical 'body feeling' for kata techniques and movements, and what we can do about trying to develop this special feeling. So, this article is purely about the physical and athletic movement required for good kata. Not about emotional feelings or spirit, although they work hand in hand as we know. This is a focus on the purely 'physical' aspects. After over fifty years of training, my interest remains in the concept of maximum effect with the minimum of effort. I'll try and expand on the point I'm trying to get across and the question posed regarding this special 'Feeling'. A good example is gymnastics or ballet. You can get two people who perform at the same technical level and same experience but one will be 'better' for one reason only (from a physical viewpoint not anything to do with the mind or attitude) and that is because one has a better 'FEELING' for their art. This analogy applies to any physical art or sport in my opinion, including karate and especially kata and its performance. In your own dojo you have probably observed the same at some time. You get two good students, almost identical at the physical level but one just seems to have a certain 'feeling' for the movements that the other just does not have, even though they are technically just as good as each other. I also believe that it's not always a God given gift, (someone being a natural) but that people can actually develop a special 'feeling' for whatever art form they are studying. Usually because of their great love and passion for the art. If you take all the top Japanese Shotokan instructors teaching in this country (Great Britain) senseis Enoeda, Asano, Kato, Kawasoe and Ohta, what sets their kata apart is not just their technical level but that special 'FEELING' they have for the movements. So what is this 'feeling' and how can 'we' try and develop it? There are I believe karate people far better than others in terms of pure athletic and gymnastic ability, but still, they don't have that special feeling for the kata. I personally think, that the biggest difficulty for Japanese karate instructors over the years that they have been teaching western students, has been in getting across the 'feeling' of the body during technique and movements, which is unique to the Japanese who devised and refined the art. How to explain this special feeling has been most difficult. Showing how the technique should look however, has not been a problem. I think westerners have copied the movements of the kata well, but still have 'NOT' captured the 'FEELING' and here lies the subtle difference. I think that because many words don't quite translate exactly word for word from Japanese to English or other languages, that this is still the biggest problem of trying to communicate this special 'feeling'. I think now that many Japanese senseis speak much better English (or whatever language is spoken in the country where they teach) than ever before and it's easier for students to understand what they want from us. Yet still, I have seen very few westerners with this special feeling for the kata movements, although many times they are athletically and gymnastically superior, yet their kata appears to be more cosmetic! Getting down to the hands-on 'physical' movements and various body principles which are needed to achieve the attainment of this 'feeling' for kata, something that is puzzling many students is the concept of 'contraction - expansion' of the muscles? The theory taught almost exclusively by Master Nishiyama. (See Lee Scott's letter in this issue). The theory basically seeming to be that you 'firstly' 'exhale' to contract/tense the body muscles, then quickly 'inhale' to momentarily 'relax' the muscles (for a milli second) as the technique is fired out and finally contract/tense again on impact. The problem most western students have with this idea is, that they know by now that real fights/attacks are so incredibly FAST these days, because so many young people do sports - football, athletics, kick-boxing or whatever and these people are fit, strong, fast and usually very aggressive. You will not always be attacked or get into a fight with a fat, drunken slob, who you will deal with without breaking into a sweat! Get real! It's not like that at all. So, one possible argument is, how could you apply such a theory (contraction - expansion) at such blistering speed? I think we understand this principle as it is applied during the slow movements in kata. Take for example the tate shuto uke in Sochin kata. You slowly perform the block whilst simultaneously exhaling and contracting the body muscles, then quickly inhale (relax) to fire the two punches and (contraction) kime, on completion. But to use this principle at break-neck speed without time to think, seems doubtful to many students? The same argument also holds true with the 'Vital Points' theory. No one is denying that these points exist, but hitting them at ballistic speed against an equally fast, strong, athletic attacker just seems realistically hard to believe that it can be done, even by an expert! Most people would need seriously convincing! Many boxers are 'natural' fighters, which is why it's been the number one fighting sport/art for all this time. And it ties in exactly with something Nishiyama sensei says that we will discuss in the next paragraph. Boxers seem to be relaxed, although not completely. There always appears to be a certain amount of contraction in their stomach muscles and a good firm, stable, balanced stance requiring strong leg muscles. But just like karate, they contract their muscles (naturally) on impact. It's a very natural and quickly released contraction unlike many karate students who hold the contraction/tension slightly too long. Master Nishiyama said an interesting thing (well, doesn't he always!) when he said in his interview (issue 45) that originally karate was learned by 'application' (firstly) then technique was refined later (secondly). Meaning by application, actually 'HITTING/STRIKING' things. Nowadays karate is learned the other way around, technique first, application second. Well maybe if we karateka learned application 'first' technique 'second' we would develop this natural 'feeling' for the movements? Boxers still do application first! They are introduced to Bag training immediately! Then they refine their technique, and both work hand in hand. If we consider the interviews we have read with the great karate masters, they too also started by application first. They were made to strike the makiwara from day one! So, maybe here is one secret for developing a natural feeling, which is so obvious in top karate masters or world class boxers. Application first, or at least at the same time as technique? Nowadays this is just not the case. In fact many students don't ever use bags or focus mits in their training regime. Many people say that when you combine the two (contact training and non-contact) that you will have a more 'relaxed' feel when performing techniques in fresh air? We are always hearing the Japanese instructors say that we (westerners) perform kata, 'too strong'. I heard an interesting observation about this. When you see a really good boxer working alone, doing 'shadow boxing' their movements are fluent, graceful yet full of power and energy, yet 'not' as 'strong' as if they were pounding a bag. Think of a good kata performance and this has all the same qualities! Maybe for the same reason? Getting back to relaxing the body, Kawasoe sensei made an interesting point when we were practicing kihon (basics). We were doing gyaku zuki and he was just about to punch, he was in zenkutsu dachi, front arm extended, hand open, hips in hanme (half facing). He said, "Relax, relax, but not completely." That one statement stuck in my mind and I thought at the time I must ask him after training what exactly did he mean by 'not completely'. If not completely, then where on the body did we 'not' completely relax? Sorry, but I forgot to ask him! However, next time I see him I will ask him and hopefully be able to give the answer at a later date. This is just a guess but I think he will say that there must be some contraction/tension (as opposed to being totally relaxed) in the stomach muscles, (like boxers) your lat muscles (at the sides) to keep the shoulders down and a connection to the hips, and the legs (outside/inside tension) to make a solid connection with the floor (like boxers). Anyway, we will see what he says. Another vitally important point with regard to getting a good 'feeling' for kata movement is something Nishiyama sensei stresses. That if you study the principles of body movement and make your own body work within this framework you will find success in karate. I would suggest they try to learn the principles of body movement rather than trying to copy their instructor's technique. Each of us is created differently and a six foot male will do a low block differently than a five foot woman. The real art is in grasping the principles of body movement. In other words making the principles of body movement as 'natural' as possible for our own unique body. Obviously lots and lots of training over years and years will help to develop a good feeling for the movements of kata, but just as obviously it's not the 'complete' answer. Because many senior instructors always say, that few western karateka perform kata in the same, natural, effortless way as the Japanese instructors. Some people have very 'strong' kata, but not 'beautiful'. This is because they have not made the kata match their own body. This is very important. His movements were difficult to explain, not like power coming out, more like a beautiful ballet. Judging from these comments, it appears that kata is not simply a 'show of strength' but something much deeper and far more meaningful?